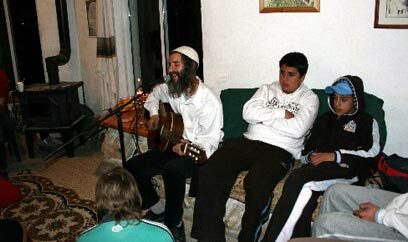 Erez Levanon, a resident of the Bat Ayin settlement, was murdered Sunday in a valley near the Palestinian village of Beit Omar in the West Bank, north of Hebron. Security officials believe that the murder was terror-related. Levanon, a 42 year-old father of three was stabbed to death not far from his vehicle. Army forces have launched searches in the area in a bid to locate the perpetrators. Palestinians reported finding the body, between Bat Ayin and Beir Omar, to the Palestinian security authorities. Security searches after suspects focused on Beit Omar and Hirbat Sapa near the wadi. Levanon kept a routine schedule of Torah studies, and spent one hour each day at a secluded location communing with God. His friend, Rabbi Michi Yossefi, said that Levanon was apparently murdered while praying at his usual spot. "Erez was an exemplary family man, who managed to reach a wonderful balance between his work and his home… he wasn't someone who stood out but a very modest man," Yossefi described. Ruth Rafael, secretary of the settlement of Bat Ayin, told Ynet Sunday: “We tried to track his (the victim’s) last steps intensively since the afternoon hours, to know which direction to search. “Right now we are organizing first of all to help his family. We would also like to inform his relatives, and then issue a formal announcement about the funeral. It is still early for us to talk about him in the past tense,” Rafael said. Jerusalem Police have recently received warnings of possible attempts by terror groups to carry out attacks in the capital. a few weeks ago Border Guard officers manning the Atarot checkpoint near Jerusalem apprehended a Palestinian youngster who was also in possession of a knife. Last July the body of Eliyahu Ashri, Jewish settler from Itamar, was found in Ramallah’s Tira neighborhood five days after he was kidnapped by members of the Popular Resistance Committees. A large IDF and Shin Bet force found the body covered in dirt. See all talkbacks "Settler found stabbed to death north of Hebron"